Rising British star Hannah Barnes will ride for the newly-formed Canyon//SRAM team in next year's inaugural UCI Women's WorldTour circuit. 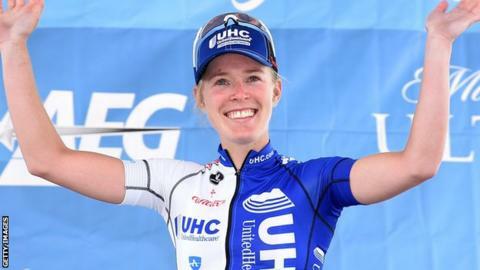 Barnes, who has spent two seasons with American team UHC-Healthcare, won the white jersey for the best young rider at this year's Women's Tour. "It's been really good in America but I'm happy to come back to Europe," said the 22-year-old from Northamptonshire. "My whole goal for 2015 was to get some good results and then come back here." Joining Barnes on the team are the overall winner of the Women's Tour, German time trial star Lisa Brennauer, and RideLondon Grand Prix winner, Italy's Barbara Guarischi. The team will ride the full 17-race Women's WorldTour calendar in 2016. Germany's Canyon will supply the bike frames, with American firm SRAM providing the components. The team's nine riders, from six countries, will wear kit from British company Rapha, which has recently announced it will no longer be supplying elite men's outfit Team Sky after 2016. Helping riders qualify for the Rio Olympics will be a focus for the team, as will the big American races, the Tour of California and Philadelphia Cycling Classic, as well as Britain's Women's Tour and the women's race at the Tour de France, La Course. "My main goal for the year is to make the team for the Olympics but with this injury I don't really know," said Barnes, who broke her ankle in August. "I'd like to go back to California and do the Tour there too."